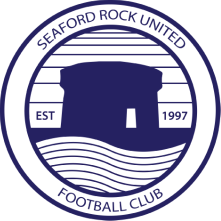 Seaford started brilliantly but were left clinging on to secure all three points against bottom-placed Leixlip United. The match was almost an exact replica of the previous match against Kilnamanagh, but crucially it was Seaford who ended up on the right side of the scoreline on this occasion. The visitors thought they had scored after just forty seconds, after Fionn Lawlor;s through-ball was cleverly overstepped by Kohei Masaki, allowing strike partner Garrett Connolly to run in on goal, only to see his powerful strike crash off the underside of the bar but not, in the referee's view, over the goalline. Seaford opened the scoring on eight minutes. Gavin Walsh was about to be substituted having picked up an early injury, but it didn't stop him leaping brilliantly at the back post to nod in the rebound after David Higgins's shot was saved by Sean Muddiman. And just moments after the restart, Walsh's replacement Andy Roe netted Seaford's second, finding the corner of the net with a sensational half-volley from 20 yards. Connolly might well have had a first half hat-trick, first seeing his effort hooked off the line after lobbing Muddiman from a Higgins pass, before failing to make a proper connection with Darragh Connolly's free kick when left in acres of space at the edge of the six yard box. Leixlip pulled one back when Craig Smith took advantage of a momen of defensive uncertainty to nick the ball around Eoin English and slot home, and late in the half Babs Animashaun skilfully worked his way to the by-line to see up Emmanuel Obadeyi, who blazed his shot over the bar. The reds had the lion's share of play after half time, but were repelled by a dogged defensive performance from Seaford, who continued to fashion the best chances. On the hour mark, Masaki saw his shot come off the foot of the post, and a defender blocked Darragh Connolly's goalbound effort, before Connolly failed to convert at the back post from a whipped cross from Ian Nolan. Muddiman produced a fine save to deny Garrett Connolly inside the final minutes, and it looked as though Seaford would rue their many missed chances when in injury time Benny Adeyemo arrived on the end of a cross just a couple of yards from goal, but somehow failed to find the back of the net. ​The win lifts Seaford from the brink of the relegation zone into the top half of a very tightly Major 1B division.